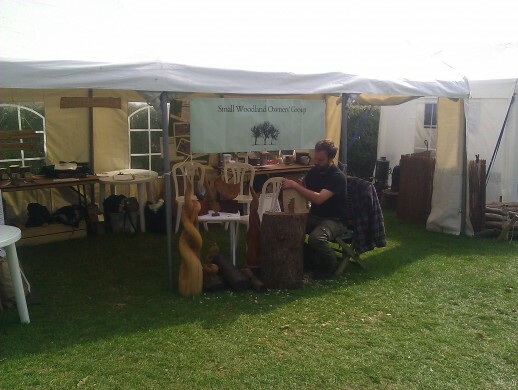 SWOG was at the Bentley Woodfair again which took place last weekend. It is one of the biggest and best shows in the country and could take you the whole weekend to go round. The highlight for me was as always was the woodland. In a slightly chillier and damper woodland this year were many of the county’s craftsmen and women, Sussex and Surrey Coppice Group was well represented and there was a strong contingent of ‘Bushcrafty’ types, all eager to explain their particular craft or expertise. It was good to see a lot of SWOG members make it to the stand and a special thanks to those that helped set up and break camp, brought interesting items to show or sell and helped on the stand. Bernie and Theresa turned up with a novel idea for getting rid of that Rhododendron….turn it into to Tea and Soft Drinks! Bernie had just returned from India where it makes a nice cuppa and thirst quencher, maybe it will catch on here too and rid us of this unwelcome invader. Still a few more woodfairs to go so check out the woodfairs site for one in your area! 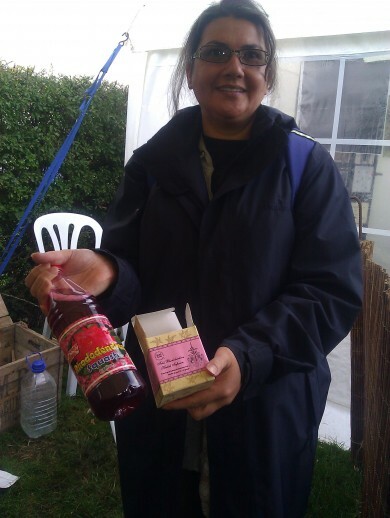 Theresa with her Rhododendrun 'wares'!